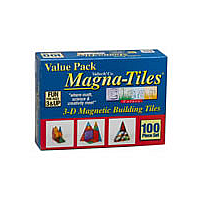 MagnaTiles 100 pc. Value Pack 4300 - Valtech Co.
Clear colored pieces of the same shapes and pc. count as standard set. These are great for light tables, and also are fully compatible with our 32 pc. standard set. They will work well alone or together with the standard solid colored pieces to make windows, skylights, etc.